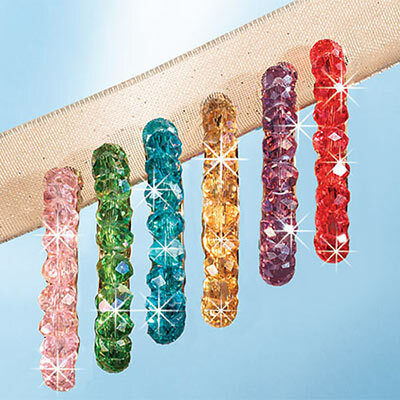 So much colour in this Beaded Sparkle Hoop Earring Set! 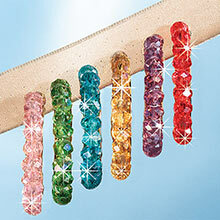 Dazzling crystal beads with an aurora borealis finish shine to make a brilliant rainbow of colours. Gold-tone hoops with pierced backs. Set includes 7 pairs. 1½"h.
On the whole just ok. Colours in the display picture are misleading, actual earrings not true to picture but close enough. Big disappointment was not getting the lighter blue pair, instead there where two dark blue ones. chalked it up to buyer beware as didn't feel it was worth all the hassle of retuning them. Delivery of order took longer than things I order from Amazon but acceptable. Just need to remember to order eary if I need something for a particular occasion.